JR obtained his Bachelor’s Degree in Business and Information Technology.He is also impacting his community by volunteering at SYSA as a Soccer Coach. He started an office cleaning franchise in 2011 while pursuing his degree. Throughout the years he has seen the value in what he was doing and the feeling and smile he left on the customer’s face. He then started thinking bigger and decided to start his own carpet cleaning business. 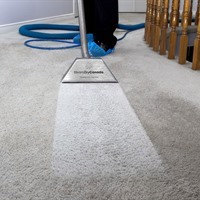 JR Carpet cleaning business puts customers ahead of everything, while providing exceptional cleaning at a reasonable cost.